Annette's Creative Journey: April Stamp of the Month Blog Hop - "You Are..."
Another month brings another Stamp of the Month from Close To My Heart. This month's set is called "You Are..." and all the images in this fun set are pictured in the right-hand column of my blog. The Stamp of the Month is only offered during its month, then it's gone. So if you like it, get it! And if you're already shopping for other scrapbooking and stamping goodies and spend at least $50 before shipping and tax, you can get the Stamp of the Month for only $5! Start shopping here. To help showcase the Stamp of the Month, over 40 CTMH consultants are sharing their designs in our monthly Blog Hop. If you're already hopping, you've likely come here from Jen Rubio's blog. Keep scrolling through my post to see where to hop to next. There's sure to be plenty of inspiration for you along the way. Have fun! 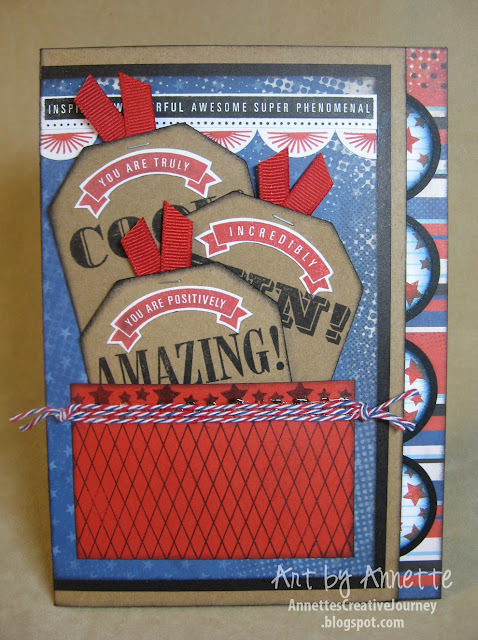 I used the new Super Hero paper pack for this card. I can't wait to use the rest of it to scrapbook my daughter's MegaCon photos. It's perfect because there are comics, periodic tables and lots of other fun prints that coordinate. To make the banner topper on the card I simply stamped the long stamp onto a strip of white card stock using black ink, and punched a 1-inch circle for the banner pennants which I stamped in Cranberry, then cut apart to make five total. Then I glued them so they butted up to the long strip. For the larger circles that go inside the card, I punched a 1 1/4-inch white circle and stamped it with the little stars in Cranberry, the thin rules with Sky, and inked the edges with Moonstruck and Black then adhered each circle to a 1 1/2-inch black circle. These were then adhered to the inside flap of the card front. 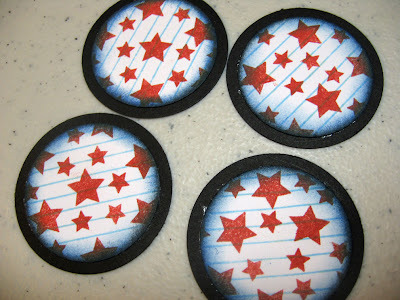 A 1-inch strip of the striped paper puts a nice background behind the circles when the card is closed. Here's another look at the finished card. 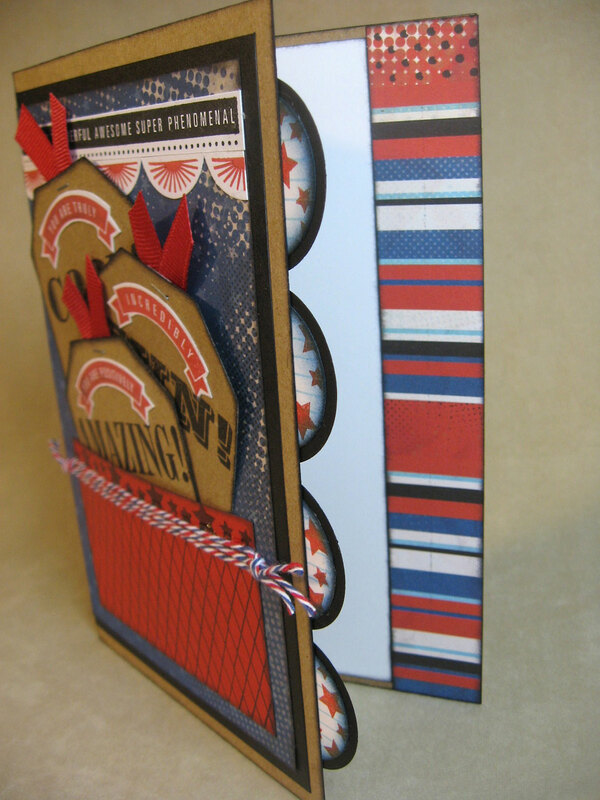 This card pattern called "Confidential" (pg. 122) comes from Close To My Heart's "Wishes" book which will soon be unavailable since all of our how-to books are retiring. Wishes is a great card-making book with beautiful samples, blueprints, tips and techniques and variations, so if you don't have yours yet, you better move fast! 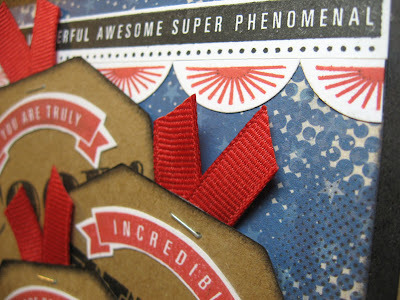 Now continue on the Blog Hop and see what Amy McVey has come up with. Awesome! 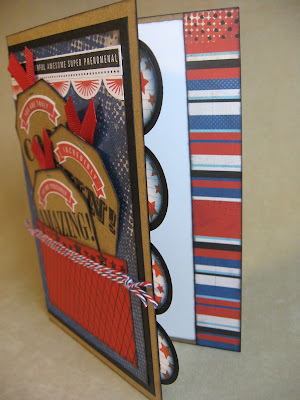 Love the layered stamps on the circles...and that fab multicolor baker's twine! This is SUPER cool! Love it! What a great way to showcase so many of the stamps in the set! Especially love the tags. Love it, this would make an awesome teen guy card. Fantastic card, love all the detail and your tag pocket! 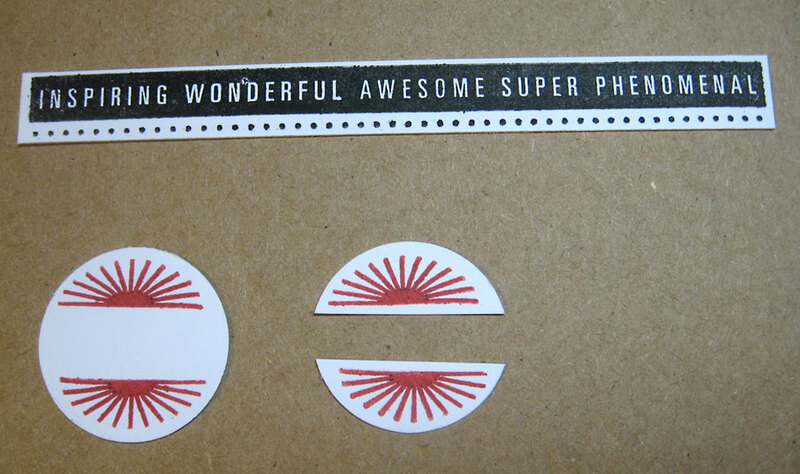 Great card - love the tags! Truly a work of art - the details are amazing! This is the BEST SOTM and Superhero card I've seen! My swap group assigned me Superhero and I have been searching for inspiration. You are an amazing artist! Stunning card! 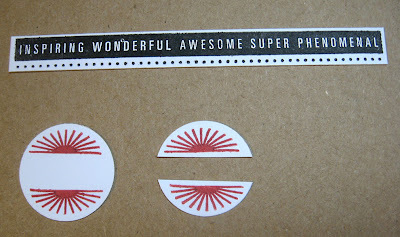 I love all the ways you used the stamps.